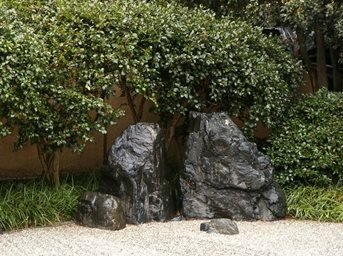 A rock grouping provides a focal point in this Japanese garden. Photo used under Creative Commons from DominusVobiscum. 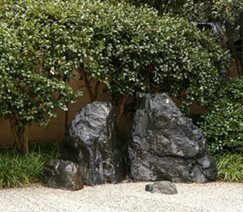 Rocks play an essential role in Japanese gardens. According to Japanese philosophy, rocks represent a sense of power and desire. In a Zen garden, rocks represent islands and are surrounded by raked gravel which represents water. In Japan, placing rocks within a landscape is considered to be a spiritual and artistic process. Rocks should be of naturally occurring shapes and vary in size. Generally, dark granite rocks should be used. If you plan to buy rocks, your local nursery will be able to put you in contact with a stone dealer. For a more affordable (and by that I mean free) source of rocks for your garden, visit a local construction site. Many times, rocks are unearthed during construction work and it's likely that the owner will be more than happy for you to haul them away.